Leaf retention: Evergreen to cold deciduous. It loses leaves below 20°F. Growth rate: Moderate to rapid depending on temperature. Mature Size: 1-3' high and nearly as wide. 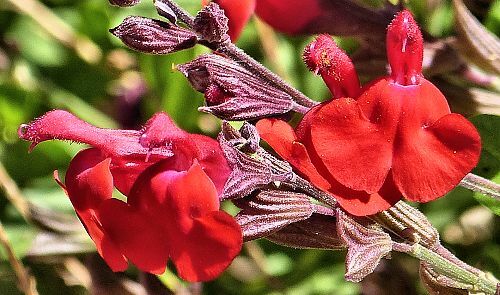 Flowers: Usually red, 1" high, wide and long, with a distinct hump on top of its upper lip, a flared two-lobed lower lip at a right angle, fragrant and edible. Cultivars available in many colors. Bloom: All year in regions without freezes. A repeat bloomer. Fruit: Up to four tiny seeds at the base of each dried calyx (cup-like structure that holds the flower and ovary). Leaves: Oval, green, smooth edges, aromatic, edible. Stems: Herbaceous from a woody base, growing woody with age. No thorns. Wildlife: Attracts hummingbirds and butterflies. Origin: Texas and Northern Mexico. Sun: Part shade much of day, especially afternoon shade. Slower to establish in full sun. Avoid reflected sun. Water once established: Once or twice a month. 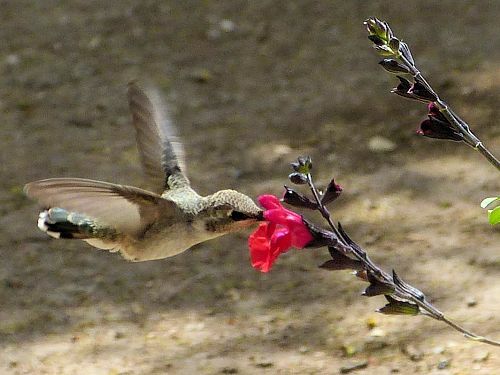 In full sun, water is recommended once or twice a week in the hottest part of the year to produce the most flowers and provide enough nectar for hummingbirds. Soil: Well drained, organic content medium to low, pH 6.1-7.8 (slightly acidic to slightly alkaline). This plant should not be fertilized once established. Mulch: This plant should not be mulched so the soil will dry quickly after watering or rain. Prune: In mid winter, prune lightly to shape, or severely to rejuvenate. Prune every 4-6 months, by as much as one-half, to avoid a leggy appearance. Propagation: Seed, cuttings, or layering. Uses: Ornamental, wildlife attractor, culinary. The leaves, tasting either like mint or a cross between mint and sage, depending on cultivar and soil moisture, can be used fresh or dried for seasonings and teas. The edible flowers, used to add color to salads, have a lettuce-like taste. For other culinary sages, see Low Water Culinary Herbs. This plant is a member of the Mint family (Lamiaceae). 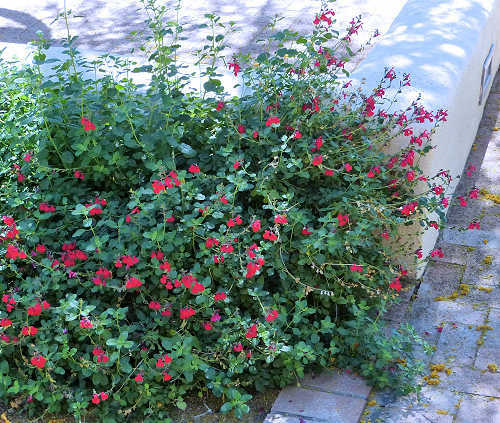 Many cultivars are available, including crosses with Salvia microphylla. 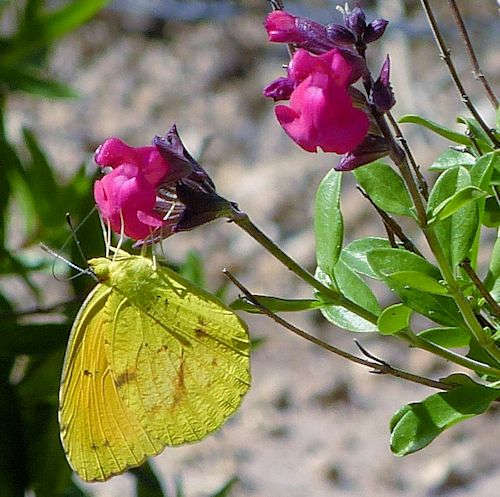 The butterfly shown in the picture is a Cloudless Sulphur.